Pampalite -- Not just another ‘light in a case’, the award winning Pampalite is the most advanced location fluorescent light available. It is the result of considerable research and development by its originator Owen Stephens SOC, a Hollywood freelance cameraman and DOP, who found existing products cumbersome and inadequate for location use. Thinking there must be a better way, Owen devised the Pampalite concept of performance, innovation and portability. 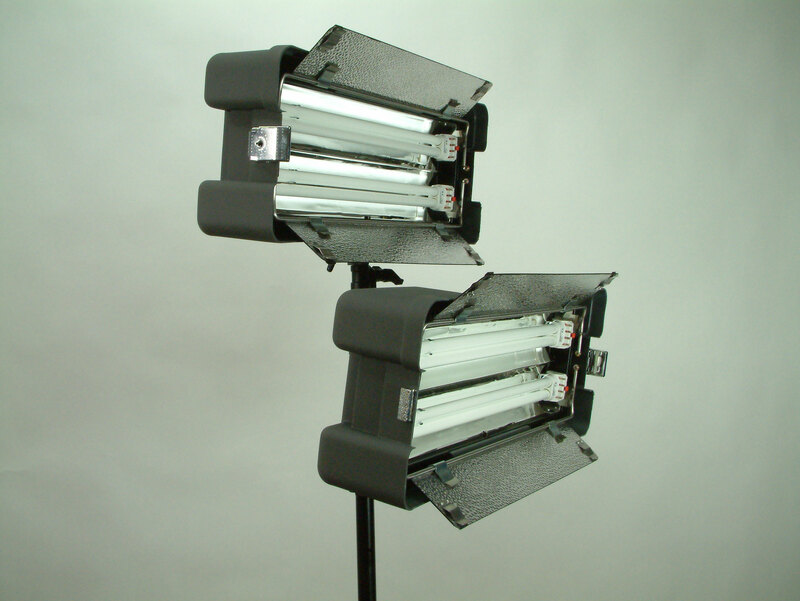 This concept has been refined by Photon Beard Ltd to give a uniquely versatile lighting tool for stills, television and film location lighting. Not just another ‘light in a case’, the award winning Pampalite is the most advanced location fluorescent light available. It is the result of considerable research and development by its originator Owen Stephens SOC, a Hollywood freelance cameraman and DOP, who found existing products cumbersome and inadequate for location use. Thinking there must be a better way, Owen devised the Pampalite concept of performance, innovation and portability. 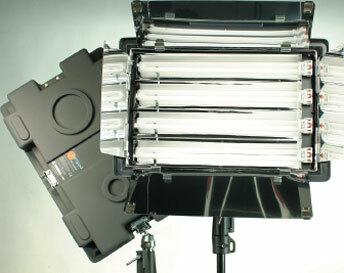 This concept has been refined by Photon Beard Ltd to give a uniquely versatile lighting tool for stills, television and film location lighting. The Pampalite uses dimming 55 watt compact fluorescent lamps mounted in carefully designed curved reflectors to give a very bright, even light output. These are supplemented by individually adjustable reflective barndoors, which can be reversed to give a matt black surface, or removed completely either separately or together. These doors are fitted with diffuser clips both sides. There are also fabric egg crates available in a choice of angles to further control light output. The Pampa2 & 4 can be mounted at almost any angle by means of the universal head. This head combines a ball and socket with a detachable connection to engage a receiver mounted on the shell of the lamphead. Each Pampalite is supplied with one universal head and two receivers, but up to two more receivers can be fitted for increased versatility and bank mounting of lampheads onto 16mm (5/8”) pins and 29mm (1 1/8”) hollows. Pampalite heads can be linked together in a variety of ways to form light banks. 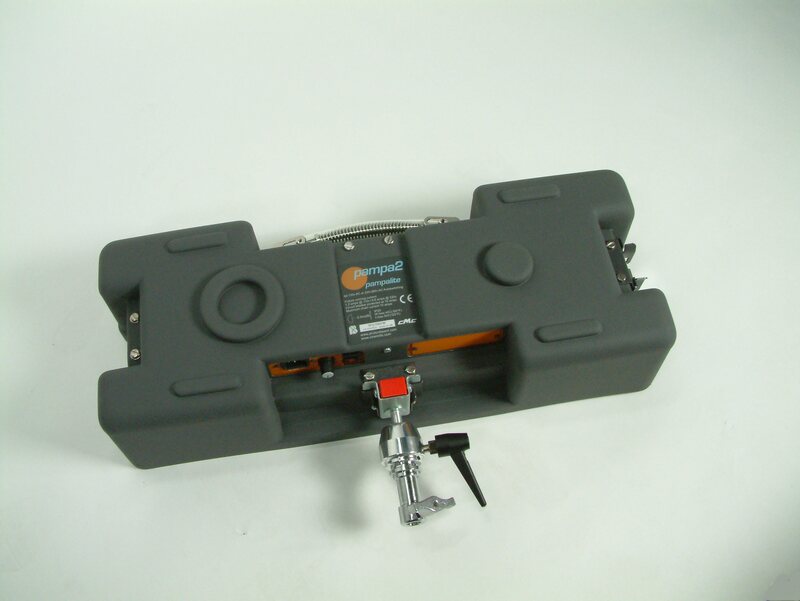 They are connected by ‘click-lock’ brackets, which interface to standard grip components, allowing both small and large banks to be constructed easily and quickly. Pampa2 & 4 will operate on any AC power supply from 90 - 130v or 200 - 260v automatically, protected by a quick reset circuit breaker. Heads can be linked for power and dimming to simplify set up and control. A DMX512 control kit is available to interface with DMX dimming systems. The Pampalite storage shell is a useful storage and transit device. The lamp tray can hold extra lamps cushioned in foam. It hinges open to reveal accessory storage. The universal head is carried in a ‘click-lock’ receiver and there is space for the mains and jump cables, and barndoor leaves. Lamphead and storage shells share the same shell profile, just a simple lock-swop and two heads, or two storage shells, may be connected for transit. So a four light bank, for example, needs only three units – two units of two heads each plus a third made from two storage shells to carry the cables and universal heads etc. Pampalite shells are moulded from tough ABS plastic with a rubberized non-slip surface. All catches and fittings are recessed for protection in transit, and the catches are simple to use and are lockable. Pampalites are easy to carry even when wearing gloves. There is simple and positive location of one unit to another for safe stacking, and a stack of units can be strapped to wheels for ease of movement. If the worst should happen, every external and internal fitting on the Pampalites can be detached (the lamphead can be removed as a complete assembly) and the shell alone can be replaced. The Pampalite concept refined for ENG and video applications, the PampaSnap is a pair of simplified Pampa2 lamp units together in a self contained single package. Each lamp unit features a single fixed 16mm (5/8”) hollow tilting mount, a non-detachable 4 metre mains cable, which is stored within the lamphead shell, and a fader-style dimmer control. It has the same light output and light control as the Pampa2, but in a lighter and more economical package, ideal for interviews, small sets etc. Distributor enquiries welcomed for certain countries/territories -- please contact Photon Beard for details. The Pampalite can be seen at Broadcast Asia in Singapore during 20th to 23rd June in the UK pavillion -- Photon Beard stand.